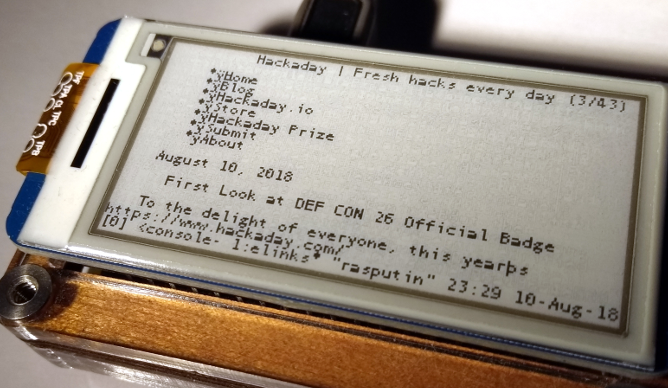 Like many hackers, we love e-ink. There’s something mesmerizing and decidedly futuristic about the way the images shift around and reconstitute themselves. Like something from Harry Potter, but that you can buy on Alibaba instead of from a shop in Diagon Alley. But as anyone who’s used the technology can tell you, the low refresh rate of an e-ink screen limits its potential applications. It works great for reading books, but beyond that its struggled to find its niche in a world of cheap LCDs. But [Zonglin Li] has recently wrapped up a project which shows that e-ink has at least one more use case: personal calendars. You can get way with only updating the screen once a day so the refresh rate won’t matter, and the rest of the time it’s going to be static anyway so you might as well enjoy the energy savings of leaving the screen off. With a Raspberry Pi behind the scenes pulling data from the Internet, it can populate the calendar with everything from your personal schedule to when your favorite podcast drops. In practice, [Zonglin] is actually updating the display every hour as he’s included the current weather conditions on the top left of the screen, but even still, this is a perfect application for the very unique properties of e-ink displays. The display is a 7.5 inch 640×384 model from Waveshare that retails for about $50 USD, so between the display, the Raspberry Pi, and something to put it all in (here, a picture frame) this is a pretty cheap build compared to some of the large format e-ink displays out there. The software side is written in Python 3, and [Zonglin] has documented how others can easily plug in their own information so it can pull schedule data from Google Calendar and local conditions from Open Weather Map. The MIT licensed source code is also very well organized and commented, so this could serve as an excellent base if you’re looking to create a more comprehensive e-ink home information display. If this seems a little too pedestrian for your tastes, you could always put together an e-ink movie player, a surprisingly functional Linux terminal, or a very slick ESP8266-based name tag. If you’ve got the better part of $1K USD and don’t know what to do with it, you could even get an e-ink license plate. We (and by extension, you) have seen the Raspberry Pi crammed into nearly every piece of gear imaginable. Putting one inside a game console is so popular it’s bordering on a meme, and putting them into old stereos and other pieces of consumer electronics isn’t far behind. It’s always interesting to see how hackers graft the modern Raspberry Pi into the original hardware, but we’ll admit it can get a bit repetitive. So how about somebody scratch building an enclosure for their jukebox project? [ComfortablyNumb] took the road less traveled when he created this very nice wooden Raspberry Pi enclosure in the shape of an eighth note. Stained and varnished and with a nice big touch screen in the middle to handle the controls, it’s an attractive and functional piece of home audio gear that we imagine most people would be happy to hang on their wall. The process starts by printing out the desired shape on a piece of paper to use as guide, and then gluing together strips of wood to create the rough outline. Then the surface was thoroughly sanded to bring all of the strips of wood to the same level, and the final design was cut out. On the back of the note, [ComfortablyNumb] boxed out an area to hold the Waveshare seven-inch touch screen panel and the Raspberry Pi itself. 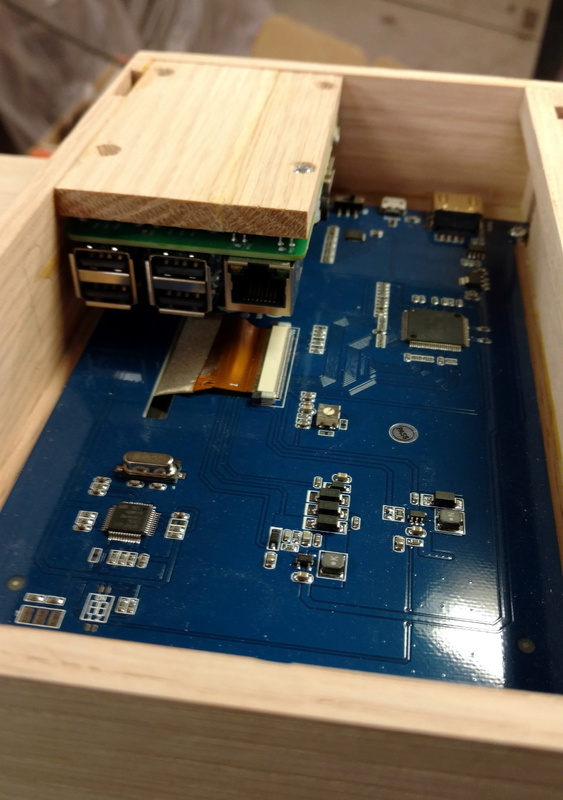 Having seen so many projects where the Pi is rather unceremoniously shoehorned into another device, it’s refreshing to see the results of a purpose-built enclosure. Since [ComfortablyNumb] was able to build the electronics compartment to his exact dimensions, the final result looks exceptionally clean and professional. Not a drop of hot glue to be seen. It also helps that this build only required the Pi and the display; as the device is meant to be plugged into an existing audio setup, there’s no onboard amplifier. The audiophiles out there might recoil in horror, but adding a dedicated digital to analog converter (DAC) would be easy enough to add if the stock audio on the Pi isn’t good enough for you. The project is finished off with stain and several coats of varnish to get that deep and rich color. We don’t often find ourselves working with dead trees around these parts, but we’ve got to admit that the final product does look quite handsome. Certainly beats the LEGO cases many of our Pi projects live in. If you’re looking for more wooden-encased Pi jukeboxes, you might enjoy this somewhat abstract magstripe-based take on the concept. Of course, we’ve also seen our fair share of actual jukeboxes receive a Raspberry infusion over the years. It’s pretty hard to use the internet to complete a task without being frequently distracted. For better or worse, there are rabbit holes at every turn and whilst exploring them can be a delight, sometimes you just need to focus on a task at hand. The solution could be in the form of distraction-blocking software, razor-sharp willpower, or a beautifully crafted modern “typewriter”. The constraint and restriction of a traditional typewriter appealed to [NinjaTrappeur], but the inability to correct typos and share content online was a dealbreaker. A hybrid was the answer, with a mechanical keyboard commanding an E-ink display driven by a Raspberry Pi. The main point of interest in this build is the E-ink screen. Though it’s easy to acquire theses displays in small sizes, obtaining a screen greater than four inches proved to be a challenge. Once acquired, driving the screen over SPI was easy, but the refresh rate was horrific. The display takes three seconds to redraw, and whilst [NinjaTrappeur] was hoping to implement a faster “partial refresh”, he was unable to read the appropriate values from the onboard flash to enable manual control of the drawing stages. Needless to say, [NinjaTrappeur] asks if people have had success driving these displays at a more usable rate, and would love to hear from you if so. Some auxiliary hacks come in the form of terminal emulator adaptation, porting the E-ink screen library from C++ to C, and capturing the keyboard input. A handmade wooden case finishes it off. If it’s old-school typewriters that float your boat, we’ve got you covered: this solenoid-actuated typewriter printer eventually became a musical instrument, and this daisy wheel machine produces ASCII art from a live camera. [David Watts] picked up an inexpensive Waveshare e-Paper display. He made a video about using it with a breadboard, and you can see it below. The E-Paper or E-Ink displays have several advantages. They are low power, they retain their display even without power, and they are very visible in direct light. The downside is they don’t update as fast as some other display technologies.